Options on unlock all tech as researched, exclude sapce science techs, infinite tech individual levels, and more. Checked: All tech are researched. Checked: All of the specific type of tech are not researched. Unchecked: Follow the general settings. For example, space tech are all tech that requiring space science packs. 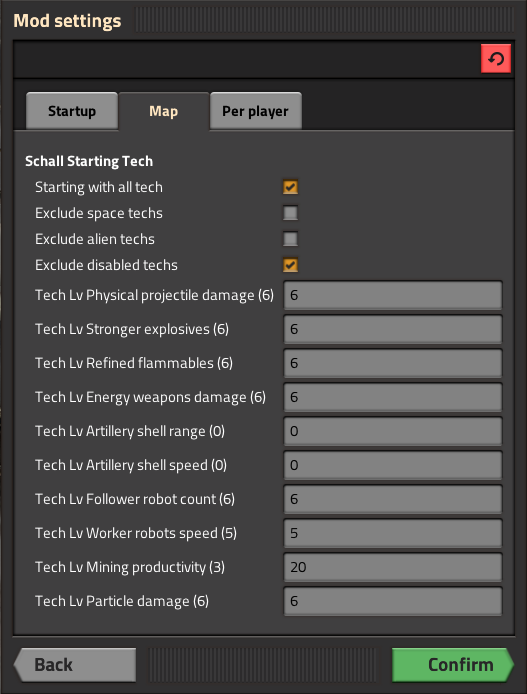 Alien tech refers to any tech requiring alien science packs, which are introduced by Schall Alien Loot mod. The number in paranthesis is the maximum reachable level without the space science pack (thus not requiring rocket launch). This mod set them as the default settings. We have adjusted "Mining productivity" to level 20, leaving others as default. 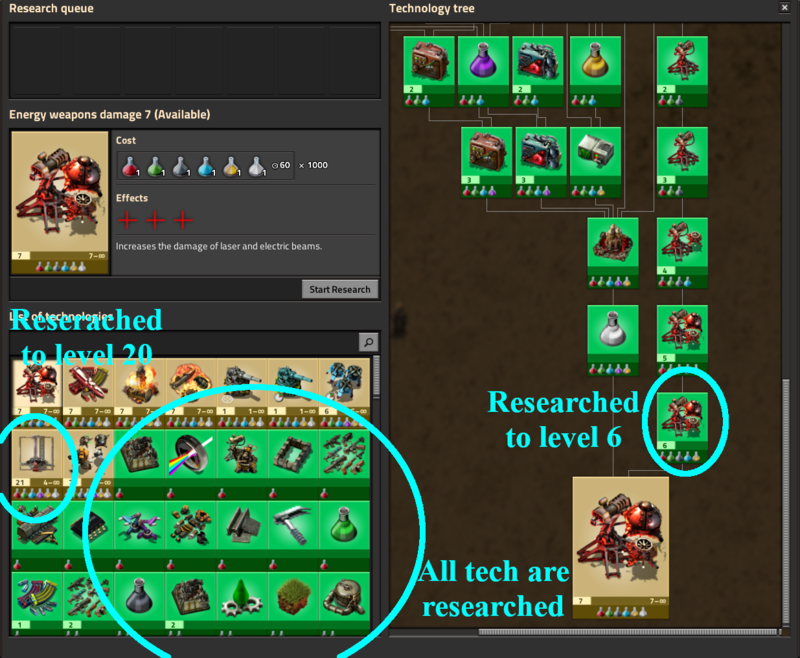 Now starts a new game, in the research UI, you can find all technologies are researched, and same tech levels as set in the settings. This mod performs nothing other than adjusting technology levels when a player first creates a game. This mod should be safe to be disabled/uninstalled at any time. Schall Alien Tech is supported. You can adjust the tech level of particle damage. It is supposed to work with all non-infinite tech as well. The behaviour of new infinite tech is unknown, since it may depends on how the tech is created and mod load order. Plus there are no options to set that tech to desired level. If you have any favourite mods wanting to be supported, please leave a message in comments section.